The Mariners locked up their franchise player with a record-setting contract and added a number of bats this winter. Joe Saunders, SP: one year, $7MM. $6.5MM Mutual option for 2014. Kelly Shoppach, C: one year, $1.5MM. Raul Ibanez, OF: one year, $2.75MM. Oliver Perez, SP: one year, $1.5MM. Jason Bay, OF: one year, $1MM. Kameron Loe, Jon Garland, Mike Jacobs, Jeremy Bonderman, Robert Andino, Ronny Paulino. Acquired OF Abraham Almonte from Yankees for P Shawn Kelley. Acquired OF Mike Morse in a three-way deal for C John Jaso. Acquired IF Kendrys Morales from Angels for SP Jason Vargas. Acquired UT Robert Andino from Orioles for OF Trayvon Robinson. Claimed OF Scott Cousins off waivers from Blue Jays. Later claimed off waivers by Angels. Felix Hernandez, SP: seven years, $175MM. Hisashi Iwakuma, P: two years, $14MM. $7MM Club option for 2015. John Jaso, Miguel Olivo, Mike Carp, Scott Cousins, Shawn Kelley, George Sherrill, Jason Vargas. After finishing last in the league in scoring for three consecutive years, the Mariners focused on adding offense this offseason. The team started by moving in the fences at Safeco Field in an attempt to make the ballpark more hitter-friendly. Seattle GM Jack Zduriencik followed up by adding a number of established hitters through free agency and trades. The middle of the Mariners' lineup will look much different in 2013. 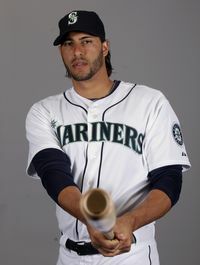 Michael Morse (pictured) has established himself as a productive MLB hitter since the Mariners traded him to Washington in 2009. He'll add welcome right-handed power to Eric Wedge's lineup, though he's a below average defender who's one year away from free agency. The Mariners sent lefty masher John Jaso to Oakland in the deal, only to sign righty masher Kelly Shoppach two weeks later. Earlier in the offseason, the Mariners dealt from an area of depth — the rotation — to complete a trade with a different division rival. They acquired Kendrys Morales from the Angels for Jason Vargas in a deal that should work for both clubs. The switch-hitting Morales bounced back nicely in 2012 and should provide power again in 2013. Like Vargas, he's a year away from free agency, so neither team surrendered a long-term piece. After trading Vargas the Mariners had a void in their rotation, which they later filled by signing Joe Saunders to a one-year deal. Zduriencik's patience paid off, as he signed Saunders to a contract worth $6.5MM instead of overpaying early in the offseason. This deal gives the Mariners stability at the back of the rotation in 2013 without saddling them with a cumbersome long-term contract. The Mariners also turned to free agency, expressing varying degrees of interest in Josh Hamilton, Nick Swisher and Michael Bourn. Ultimately the most prominent free agent position player they signed was former Mariner Raul Ibanez. The 40-year-old should continue to produce as long as Eric Wedge mimics Joe Girardi's strategy of limiting Ibanez's exposure to left-handed pitching. Zduriencik remade his bench this offseason, with Shoppach, Ibanez, Robert Andino and Jason Bay. It's been a while since the 34-year-old Bay added value on offense, so it won't be surprising if the Mariners end up releasing him. Even so, the British Columbia native required just a $1MM commitment. The Mariners acquired Andino, non-tendered him and re-signed him. Every team needs a utility infielder for its bench, and Andino won’t be worse than Munenori Kawasaki. Still just 28, Andino posted a .327 on-base percentage in 511 plate appearances in 2011. Seattle had considerable pitching depth entering the offseason, so the front office didn't need to spend aggressively on pitching. Newcomers Kameron Loe and Jon Garland joined the pitching staff on modest free agent contracts. The Mariners scored 619 runs in 2012, a dropoff of more than 100 runs compared to the average American League club (721). In other words they must improve considerably to measure up to their rivals. Morse, Morales, Ibanez and others will make a difference, but the group doesn't include an impact bat. There's potential for a breakout season from someone like Dustin Ackley or Jesus Montero, and the dimension changes could help. Still, the Mariners' offense remains a question mark until the lineup proves otherwise. Determined to add offense, the Mariners acquired a number of players — Ibanez, Morse, Bay and Morales for example – who have questionable defensive skills. Incorporating a number of these players into the lineup at once will be a challenge for Wedge, especially with Michael Saunders in right field and Justin Smoak at first base. Finally, many of the team’s additions will hit free agency this coming offseason. The contracts for Joe Saunders, Morse, Morales, Ibanez, Bay and Shoppach expire after the season. Even if Zduriencik’s plan works, this team will face another busy winter a year from now. The Mariners extended Felix Hernandez with a record-setting seven-year, $175MM extension last month. The deal establishes a new record guarantee for pitchers, so it’s hard not to like it from the perspective of Hernandez and his representatives at Octagon. The Mariners were never going to get a substantial discount on an extension covering only free agent seasons. Record contract or not, the Mariners do well to keep one of the top pitchers in baseball in the organization. The contract includes a noteworthy eighth-year option. Once some concern emerged regarding Hernandez's elbow, the sides agreed to add a $1MM option that triggers if he sustains a specific elbow injury and misses substantial time. This provides the Mariners with a measure of protection against the possibility that Hernandez’s elbow issues will linger. The 2013 Mariners won’t be mistaken for the 2012 version of the club. They should score more runs than in years past, and with multiple career years and good health they could win more games than they lose. Even so, the most realistic outcome for this club seems to be a fourth place finish in the AL West. The Angels added the top position player available and rounded out their rotation after narrowly missing the 2012 playoffs. Josh Hamilton, OF: five years, $125MM. Sean Burnett, RP: two years, $8MM. $4.5MM Club option for 2015. Joe Blanton, SP: two years, $15MM. Club option for 2015. Ryan Madson, RP: one year, $3.5MM. Ervin Santana, SP: one year, $13MM. Club option exercised. Later traded to Royals. Acquired SP Jason Vargas from Mariners for 1B Kendrys Morales. Acquired SP Tommy Hanson from Braves for RP Jordan Walden. Acquired P Brandon Sisk from Royals for SP Ervin Santana. Claimed OF Scott Cousins off waivers from Mariners. Claimed IF Tommy Field off waivers from Twins. Chris Iannetta, C: three years, $15.5MM. Zack Greinke, Dan Haren, Ervin Santana, Jordan Walden, Kendrys Morales, Torii Hunter, Bobby Wilson, Maicer Izturis, LaTroy Hawkins. Teams seeking bargains don't shop for elite free agents. Fortunately for Angels fans, owner Arte Moreno seems more concerned about adding impact players than uncovering bargains. For the second consecutive offseason, Moreno and general manager Jerry Dipoto landed the top free agent position player. Josh Hamilton signed a five-year, $125MM deal after being pursued by division rivals Seattle and Texas. On the field, Hamilton makes the Angels a markedly better team. He has tremendous power and his high batting averages drive his on-base percentage well above league average. The top of the Angels’ batting order will now intimidate even more teams. The off-field questions surrounding Hamilton are well-documented, and $125MM represents a massive commitment. The Angels are assuming considerable risk with this deal. But as a large market team they can afford take on risks, so the decision to spend on MVP-caliber talent is defensible. After declining the club option for Dan Haren and re-directing Ervin Santana to the Royals, the Angels needed to acquire starting pitching depth. They signed one pitcher and turned to the trade market for two more additions. In Blanton the Angels added a dependable back-of-the-rotation arm. A two-year, $15MM commitment strikes me as fair value for both sides considering Blanton offers durability but limited upside. Angel Stadium has ranked among the ten most difficult home run environments in MLB for each of the past three seasons, which could benefit Blanton, a pitcher who struggles to limit homers. Vargas is a fly ball pitcher who could also benefit from the depressed home run environment and the Angels' speedy outfield of Hamilton, Mike Trout and Peter Bourjos. Dipoto acquired Vargas from the Mariners for Kendrys Morales in a deal that makes sense for the Angels and their AL West rivals. Vargas should provide steady innings in the middle of the team's rotation, something the Angels can use more than Morales' bat, especially after the Hamilton signing. Tommy Hanson took a step back in 2012, both in terms of traditional stats and fastball velocity. At $3.73MM he is no longer the bargain he once was. It's not clear what Hanson can offer, especially now that he has encountered triceps soreness. This isn't the only injury question with Hanson, who has recently dealt with back and shoulder issues. Nevertheless I like the decision to acquire Hanson for hard-throwing 25-year-old Jordan Walden. The Angels should have a capable bullpen without Walden, and if Hanson pitches poorly he can be non-tendered a year from now. Dipoto added to his bullpen, spending on free agents Ryan Madson and Sean Burnett. Burnett, one of the top left-handed relievers available in free agency, obtained a two-year, $8MM deal. He and lefty Scott Downs will give manager Mike Scioscia plenty of flexibility late in games. It appears that Madson will start the season on the disabled list as his recovery from Tommy John surgery continues. The results have been troubling so far, yet the decision to invest $3.5MM in a reliever as accomplished as Madson was justifiable. The Angels' rotation remains questionable entering the season. Hanson represents an injury concern, and there doesn't appear to be much depth beyond Jerome Williams and Garrett Richards. As long as Kyle Lohse remains available in free agency he could be a tempting option for Dipoto. The Angels already gave up their first rounder to sign Hamilton, which lessens the impact of signing players linked to draft pick compensation. As Jeff Sullivan of FanGraphs wrote in January, Lohse does a lot of things well. Vernon Wells, now a bench player, surfaces in trade rumors from time to time when rival teams are looking for veteran right-handed bats. At this stage it looks as though Wells is staying put. Whether the Angels trade him or not, they'll be responsible for nearly all of the $42MM remaining on his contract. It doesn't appear that Mike Trout will obtain a long-term deal just yet, and the team's seemingly patient approach looks prudent. Trout had a historic 2012 season, which means potential comparables are either in the Hall of Fame or Cooperstown-bound. For this reason the outfielder would have a strong case for a record-setting contract for players in his service class — potentially $100MM plus. If Trout repeats his performance then the Angels will eventually pay him at that level. Yet they will have avoided an unprecedented commitment if he’s less exceptional in 2013. On a related note, the recent hand-wringing over Trout’s 2013 salary seems unwarranted to me. Yes, baseball’s most recent collective bargaining agreement depresses salaries for inexperienced players. But this structure is hardly new. The MLBPA signed off on the CBA, so the suggestion from agent Craig Landis that Trout should be paid more than $510K isn’t convincing (not that it hurts to ask!). We don’t often see players renouncing salaries when they’re overpaid, and we shouldn’t expect owners to pay players extra when teams have the chance to take advantage of a collectively bargained benefit. The Angels are poised to contend for the postseason after another winter of aggressive spending by Moreno. With a strong offense and a capable pitching staff they project as one of the most complete teams in the American League. The A’s made modest forays into free agency and completed a number of trades after winning the AL West in 2012. Bartolo Colon, SP: one year, $3MM. Grant Balfour, RP: one year, $4.5MM. Club option exercised. Hiroyuki Nakajima, SS. two years, $6.5MM. $5.5MM Club option for 2015. Hideki Okajima, Carlos Fisher, Garrett Olson, Pedro Viola, Brian Gordon. Acquired SS Jed Lowrie and RP Fernando Rodriguez for 1B Chris Carter, SP Brad Peacock and C Max Stassi. Acquired C John Jaso in a three-way deal for P A.J. Cole, P Blake Treinen and PTBNL (P Ian Krol). Acquired OF Jefry Marte from Mets for OF Collin Cowgill. Acquired P Chris Resop from Pirates for P Zach Thornton. Acquired P Sandy Rosario from Red Sox for PTBNL (P Graham Godfrey). Acquired IF Andy Parrino and P Andrew Werner from Padres for P Tyson Ross and IF A.J. Kirby-Jones. Acquired OF Chris Young in a three-way deal for IF Cliff Pennington and IF Yordy Cabrera. Jonny Gomes, Cliff Pennington, Stephen Drew, Brandon Inge, George Kottaras, Chris Carter, Yordy Cabrera, Brandon Hicks, A.J. Cole, Graham Godfrey, Brandon McCarthy, Brad Peacock, Sandy Rosario. The Athletics addressed their infield this offseason, acquiring the versatile Jed Lowrie and signing a veteran Japanese infielder. Billy Beane also added pitching depth in an offseason that wasn’t quite as dramatic as his exceptionally productive 2011-12 winter. The A's acquired Lowrie from the Astros for Chris Carter and prospects Max Stassi and Brad Peacock. Though Beane gave up lots of long-term value in the deal, Lowrie helps the Athletics now, addressing their biggest offseason need at a time that free agent infield options were limited (more on his deal later). 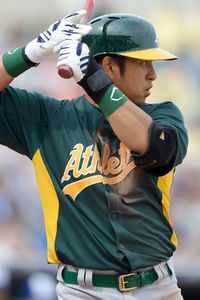 In Hiroyuki Nakajima (pictured) the Athletics added an accomplished Japanese hitter who projects to replace Stephen Drew as the team's everyday shortstop. The A's are paying Nakajima like a backup, so financial considerations won't prevent the team from making a change if his production in the U.S. doesn't compare to his NPB line of .310/.381/.474. The A’s also had interest in re-signing Drew, who ultimately signed a one-year deal with Boston. The A's gave up three prospects, including A.J. Cole, to Washington in the three-way deal that sent John Jaso to Oakland. Jaso, who's controllable through 2015, hits right-handed pitching really well. Manager Bob Melvin didn't hesitate to use platoons in 2012 and he has the making of a new one in Jaso and Derek Norris. Early on in the offseason the A’s acquired Chris Young for Cliff Pennington in yet another deal with the Diamondbacks. The A’s did well to obtain an up-the-middle player with some offensive skills for Pennington, even though they don’t presently have a starting role for Young. Teams tend to find opportunities for talented bench players over the course of a six-month season, so expect Young to contribute. Bartolo Colon re-signed with the A's on a one-year, $3MM contract that provides the team with additional depth. The 39-year-old will begin the season on the restricted list to serve a suspension for violating MLB's drug policy. Once he serves the final five games of his suspension he'll be able to contribute as a back-of-the-rotation starter. At $3MM this is a worthwhile low-risk, low-reward expenditure. The A's added to their bullpen, exercising Grant Balfour's 2013 option and sending minor league right-hander Zach Thornton to Pittsburgh for Chris Resop. The 30-year-old Resop provides the A's with a durable arm; he made 60-plus appearances in both 2011 and 2012 with the Pirates. The middle infield remains a question for the club, as it’s not clear how much Nakajima, Scott Sizemore and Jemile Weeks can contribute. Beane is a deal-maker and could obtain an upgrade midseason if necessary. However, there are rarely many above average middle infielders available in trades and the asking prices on the few quality players tend to be high. Other teams could inquire about players like Young given the Athletics’ outfield depth. The team seems content to keep all of their outfielders for now, but could strike a deal if a need emerges in Oakland midseason. The A's entered the offseason in need of help on the left side of the infield. Lowrie, an oft-injured 28-year-old, represents an upgrade for the Athletics whether he plays shortstop, third base or second. They surrendered an intriguing collection of talent to acquire Lowrie, who's under team control for two more seasons. Even though he doesn't appear to be a long-term piece, Lowrie gives the A's what they need now. For a team set up to contend in 2013-14 this exchange makes sense. While the team assumes some risk here, the free agent market for shortstops was barren besides Drew, another player with recent health issues. The A’s did a tremendous job at preventing opponents from scoring in 2012. With many of the same players back for another season, the club should stay in most games and contend again in 2013. The Astros’ patient approach to building a contender won’t lead to many wins at the MLB level in 2013. The club remains focused on developing a strong base of prospects and young players for future seasons. Jose Veras, RP: one year, $2MM. $3.25MM Club Option for 2014. Carlos Pena, 1B: one year, $2.9MM. Erik Bedard, Rick Ankiel, Trevor Crowe, Edgar Gonzalez, Jose Valdez, Sergio Escalona. Acquired 1B Chris Carter, C Max Stassi and SP Brad Peacock from Athletics for SS Jed Lowrie and RP Fernando Rodriguez. Acquired P John Ely from Dodgers for P Rob Rasmussen. Acquired SP Alex White and P Alex Gillingham from Rockies for P Wilton Lopez and PTBNL. Claimed P Mickey Storey off waivers from Yankees. Claimed P Philip Humber off waivers from White Sox. Claimed OF Che-Hsuan off waivers from Red Sox. Claimed P Josh Fields from Red Sox in Rule 5 draft. Claimed P Sam Demel off waivers from Diamondbacks. Claimed IF Jake Delmore off waivers from Diamonbacks. Jed Lowrie, Jordan Schafer, Wilton Lopez, Mickey Storey, Fernando Rodriguez, Chris Snyder. There’s reason to believe general manager Jeff Luhnow will build a contender in Houston. He has a track record of success, the support of ownership, and even an endorsement from Bill James. Be that as it may, Luhnow doesn’t have much proven talent at the MLB level. And as the Astros enter their second full season under Luhnow and owner Jim Crane, they’re expected to finish with the fewest wins in baseball for the third consecutive time. The Astros took advantage of their status as a non-contender this winter, acquiring players with upside in the hopes that some become part of the team's core. Chris Carter could be one such player for the Astros. Acquired along with prospects Brad Peacock and Max Stassi, Carter provides the Astros with a powerful bat coming off of his strongest season to date. And unlike Jed Lowrie, the primary piece headed to Oakland in the deal, he's controllable for the long-term. The 26-year-old Carter won't be eligible for free agency until after the 2018 season. Lowrie's a talented player, but given his injury history (career high in games: 97), cost ($2.4MM) and proximity to free agency (two years of team control remaining) it made sense to trade him for a controllable player with power such as Carter. Houston added pitching depth with a series of low-risk acquisitions. Though Alex White struggled as a member of the Rockies' rotation, the former top prospect offers a hint of upside. The Astros parted with Wilton Lopez to acquire White with another decision that emphasizes youth over experience. Luhnow also traded for Peacock, who entered the 2012 season as the 36th-ranked prospect in MLB, according to Baseball America. Like White, Peacock struggled in 2012, posting an unsightly 6.01 ERA in 134 2/3 innings at Triple-A. There's also John Ely, who had a strong season with the Dodgers' Triple-A affiliate in 2012 and now provides Houston with depth as a long man in the bullpen or extra starter. A team in the Astros’ position must take advantage of the waiver wire, and Luhnow did just that, claiming players often when 40-man roster space became available. Houston used its Rule 5 draft pick to add Josh Fields a 27-year-old right-hander who struck out 78 hitters in 58 1/3 innings in the upper levels of Boston's minor league system in 2012. The 2008 first round selection might never succeed at the MLB level, but the Astros are much better positioned to find out than a club that hopes to contend in 2013. Credit the team for identifying a promising player and giving him the chance to stick. The Astros claimed Philip Humber, who struggled down the stretch in 2012 after pitching a perfect game in April. With a salary of just $1.3MM and recent success as an MLB starter, Humber is worth a look at the back of the rotation. Erik Bedard, who signed a minor league contract with the Astros, provides intrigue with the familiar ‘health permitting’ caveat. 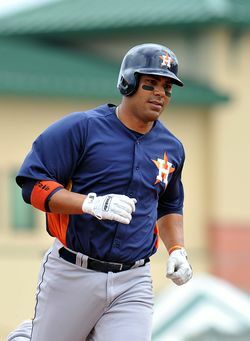 Luhnow rounded out the team’s roster with veterans such as Carlos Pena, Rick Ankiel and Jose Veras. These players aren’t here to make a long-term impact. Instead, they’re stopgaps who could be flipped for valuable long-term pieces at the 2013 trade deadline. Luhnow, who acquired Matt Dominguez for Carlos Lee last year, could look to make similar trades this coming summer. The Astros' roster is full of question marks, and that’s by design. In order to determine what they have, they must see their players at the MLB level. Luhnow told Keith Law on ESPN's Behind The Dish podcast that he’s ready to embrace the unpredictability of young players and acknowledged that an inexperienced roster means lots of variability (the entire interview is worth a listen). Acquiring too many established players could also prevent younger players from getting the playing time required to develop. Virtually all of Houston's lineup, rotation and bullpen includes question marks. The roster includes a handful of veterans, and some relatively young players such as Jose Altuve and Bud Norris who have established themselves as productive Major Leaguers. However, most others on this team have lots to prove. The Astros now face the question of how soon to begin selling. Some owners would find it unseemly to consider trades before June or July, but Crane could be an exception. Lucas Harrell and Bud Norris are already drawing interest and veteran players such as Pena could soon generate interest as well. The Astros could enjoy additional leverage in early-season trade talks, when most teams are dreaming of making a run at the Wild Card and few clubs are willing to sell. Like most of the Astros’ recent additions, manager Bo Porter joined the organization because of what he can offer in the long term. Luhnow recently told the New York Daily News that he can envision Porter leading the Astros "for decades, not just years.” For now the former Nationals third base coach has been tasked with creating a culture of opportunity in Houston. “I believe that the number one job you do as a manager is to do what you can to let players play to their potential,” he explained at the Winter Meetings. If Porter can accomplish his goal with Luhnow’s new acquisitions, the Astros will be that much closer to contention. Building a contender takes years, and the Astros need more time to become relevant again. Even so, 2013 will be an important year for the Astros as they look to uncover some core pieces for future seasons. They'll select first overall in the upcoming amateur draft and should have a top selection again a year from now. Don’t expect many victories at the MLB level though. This year’s Astros project as one of the worst teams in baseball. Kyle Lohse continues pitching simulated games in anticipation of signing with an MLB team before the amateur draft takes place in June. The market for the right-hander finally seems to be taking shape. The Angels haven't fully ruled out Lohse and the Rockies have done their due diligence. The Rangers and Brewers are keeping tabs on Lohse, but the Royals and Reds don't appear to be talking to agent Scott Boras. GM Jon Daniels told Jim Bowden on MLB Network Radio that the Rangers aren't likely to sign Lohse (Twitter links). Daniels didn't completely rule out a deal, however. Rival general managers say Lohse remains unsigned because of Boras' demands, not just the new draft pick compensation rules, Bowden writes. The Blue Jays are at their payroll limit and will not pursue Lohse, Ken Rosenthal of FOX Sports reports (on Twitter). While Ricky Romero has looked shaky this spring, J.A. Happ provides insurance as an extra starter. Lohse told Bob Nightengale of USA Today that he’s “in an awkward spot” now that the season is approaching. The 34-year-old is scheduled to pitch a simulated game at a local community college today. Boras predicted to Nightengale that teams will intensify their pursuit of Lohse once younger pitchers falter. "His value only rises because there's a greater need now. The demand for him is created by attrition when teams learn that their younger pitching can't meet their need.” The agent said “plenty” of teams are interested. The Phillies have released Rodrigo Lopez, Jim Salisbury of CSNPhilly.com reports (on Twitter). Lopez, an MVP Sports Group client, signed a minor league deal with Philadelphia in January. He would have earned $1MM on the big league roster but will instead hit free agency. Lopez made four relief appearances for the Cubs last season, but spent most of the year in Triple-A. The 37-year-old posted a 5.28 ERA with 6.8 K/9 and 3.2 BB/9 in 73 1/3 innings with Chicago's Iowa affiliate. A veteran of 11 MLB seasons, Lopez posted a 4.42 ERA in 97 2/3 innings for the 2011 Cubs. The Phillies have confirmed the move. The Angels released utility player Bill Hall, Alden Gonzalez of MLB.com reports (on Twitter). Hall, a client of Gaylord Sports Management, signed a minor league deal with the Angels in January. Hall appeared in seven games for the Orioles in 2012, when he bounced on and off of Baltimore's 40-man roster. The 33-year-old spent the majority of the season with the Orioles' Triple-A team, and posted a .246/.300/.430 batting line with 15 home runs in 370 plate appearances at Norfolk. The 11-year MLB veteran has spent considerable time at second base, third base and left field in recent years. The Blue Jays claimed Todd Redmond off of waivers from the Orioles, Dan Connolly of the Baltimore Sun reports (on Twitter). The Blue Jays confirmed the move, adding that they optioned Redmond to Triple-A Buffalo. Toronto placed Drew Hutchison on the 60-day disabled list to create roster space for Redmond. The Orioles had claimed the right-hander off of waivers from the Reds last month. The 27-year-old made his MLB debut in 2012, starting one game at the big league level. He spent most of the season at Triple-A, where he posted a 3.63 ERA with 8.2 K/9 and 2.4 BB/9 in 148 2/3 innings. The Reds acquired him from the Braves for Paul Janish last July. The Royals announced that they released outfielder Endy Chavez (Twitter link). The Legacy Agency represents Chavez, who is now a free agent. The Royals added Chavez on a minor league deal in December after he spent the 2012 season with Baltimore. Chavez played all three outfield positions for the Orioles last year, posting a .203/.236/.278 batting line in 169 plate appearances. The 35-year-old has played for seven teams in his 11-year MLB career. The Giants have released Wilson Valdez and Ramon Ramirez, Henry Schulman of the San Francisco Chronicle reports (on Twitter). Both players are now free agents. Valdez and Ramirez had opt outs in their contracts with the team, Andrew Baggarly ‏of CSNBayArea reports (Twitter links). The Giants would like to re-sign Ramirez to a minor league deal if he doesn't find a better opportunity elsewhere. Valdez, a client of Wasserman Media Group, appeared in 77 games for the Reds in 2012, playing shortstop, second base, third base and even center field. The 34-year-old posted a .206/.236/.227 batting line in 208 plate appearances with Cincinnati. The Giants signed Ramirez to a minor league deal last month. He appeared in 58 games for the Mets in 2012, posting a 4.24 ERA with 7.4 K/9 and 4.9 BB/9 in 63 2/3 innings out of the bullpen. The 31-year-old had a 46.7% ground ball rate and his fastball averaged 91.1 mph, according to FanGraphs.